A comedy of manners set in modern day India in which a family suddenly come in to an enormous and unexpected sum of money, and move from their housing complex in East Delhi to the super-rich side of town. ...[an] endearing, astute debut ... Breezily entertaining enough to enthrall droves of this summer’s beach and poolside readers, Windfall also manages to seamlessly insert urgent, relevant themes of gender inequity, socioeconomic prejudice and aggression, familial expectations and constrictions, isolation, entitlement, and more. Avoiding heavy-handed judgments (most of the time), the Delhi-born, internationally-raised, Cornell and Columbia-educated Basu writes what she knows, clearly familiar with adroitly navigating between East and West. Her global citizenry inspires sharp insights. 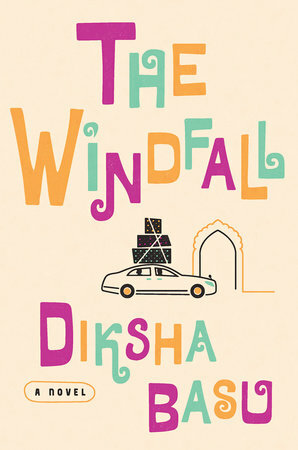 For readers who know little about modern India and are beach-novel curious (but too embarrassed to buy one), The Windfall may be the right sort of summer refreshment, providing just enough substance to defy the second part of the Seinfeld rule — 'No hugging, no learning' ... But if the final act of The Windfall suggests that money makes people bonkers, it also suggests that Basu didn’t know how to end her novel. After a madcap climax, she seems uncertain where to go, inexplicably carrying on almost exactly as she had before ... Is she a wicked satirist, a social critic, a writer of rom-coms? She needn’t choose, necessarily; but if she wants to be all three, she has to work out how to better integrate these parts of her author self. What a triple threat she’d be if she did. ...[a] charming, funny debut ... Basu sets the table for a modern and heartfelt comedy of haves and have-nots. Shuttling between characters, the novel addresses a rapidly changing India from a plethora of perspectives, and the result leaves readers laughing and engrossed. What did you think of The Windfall?